Man Down centers around Gabriel Drummer (Shia LaBeouf) who is currently undergoing what seems to be a medical evaluation following an incident during his service. Counselor Peyton (Gary Oldman) is tasked with understanding what happened during Gabriel’s mission and to determine whether or not he is at fault and able to return home. The movie takes us through Gabriel’s life at home before enlisting which introduces us to his wife Natalie Drummer (Kate Mara) and son Johnathan Drummer (Charlie Shotwell). He has a happy family and a wife, who like most is worried about her husband leaving to fight overseas. One of her comforts is that his best friend since childhood Devin Roberts (Jai Courtney) will be joining him as well. The friends since childhood embark on one of their most dangerous journeys together in an effort to protect their country and make it home safe. During their mission, things go wrong which ultimately leads to the current counseling session Gabriel is in. As the details are given you find there is more to the story than you think. The first part of the movie is slow and confusing in some parts due to the flashbacks. Once things get going you are literally sitting in suspense to find out what happens next for Gabriel. 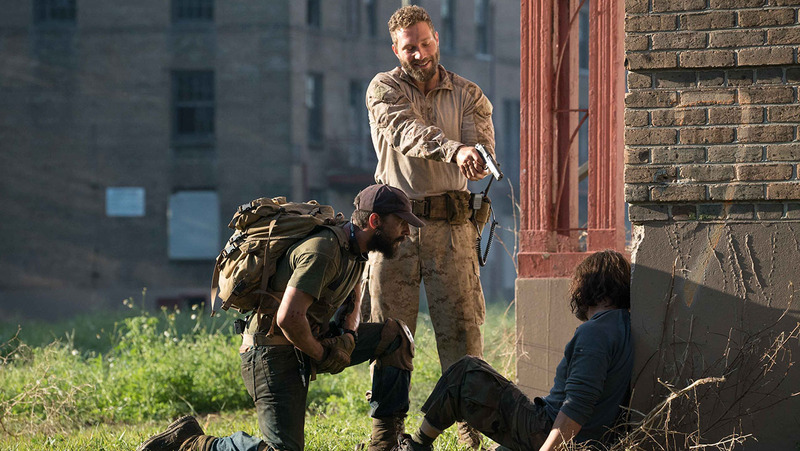 Kate Mara and Jai Courtney deliver good performances in the film considering the plot of the movie, but the star of the film is Shia LaBeouf. Overall, this film surpassed my expectations in a good way. Shia LaBeouf delivers the performance of his life in this film and is what keeps the heart of the movie-going even through the confusion. I have to let those of you know who are expecting a full-on war film this is not it. There are some action scenes and when I say some I mean one or two and some basic training scenes. Even though it may not be your typical war film it is still worth the watch. What I liked most about Man Down was the message surrounding America’s treatment of their Veterans. This movie will show you potential struggles that our Veterans face when returning home from war, especially those suffering from Post Traumatic Stress Disorder (PTSD). I recommend you PAY to see this film in theaters. Man Down is in theaters now, click here for showtimes and to purchase tickets at Fandango. Have you seen Man Down? Share your thoughts about the film below. I agree, a good movie totally worth paying to see. LaBeouf put in what could be the best performance of 2016. I didn’t find the movie hard to follow given the artistic visual cues throughout.